Believe in yourself! Have faith in your abilities! With sound self-confidence you can succeed. 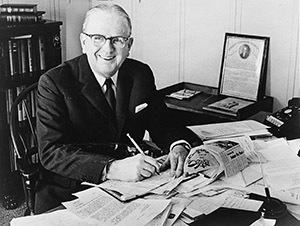 So who was Norman Vincent Peale, what did he preach, and how have his ideas impacted America’s new president? We asked James Wasserman, a keen observer of American religion and respected author on the Western Mystery Tradition, to share his insights. NEW DAWN (ND): Who was Norman Vincent Peale, the maverick Christian minister Donald Trump describes as “one of the greatest speakers” he’d ever seen? JAMES WASSERMAN (JW): Norman Vincent Peale (1898–1993) was the long-lived author of The Power of Positive Thinking, first published in 1952. (The 2015 edition from Simon and Schuster proclaims five million copies have been sold.) Peale was the foremost voice for what might be called Christian New Thought, having interwoven the idea of biblical faith with “the right to happiness.” This is a uniquely American appreciation of man’s place in the grand cosmic scheme, what Thomas Jefferson (1743–1826) identified in the Declaration of Independence as the unalienable right to “the pursuit of happiness.” Jefferson stated we were endowed with that right by our Creator – allowing for no equivocation as to the legitimacy of the source of happiness. Jefferson further suggested that the duty of the State is to protect the Natural Rights of the People. Peale, a 33° Freemason, was the Trump family pastor and young Donald regularly attended his services. Peale officiated at his first marriage, the weddings of both his sisters, and the funerals of Donald’s parents. The first chapter of Peale’s classic is called “Believe in Yourself,” a message Trump apparently took to heart and which may have allowed him to survive the almost universal waves of hatred directed at him by politicians of both parties, media mavens and their designated talking heads, and the assembled glitterati of the entertainment industry. ND: How does Rev. Peale’s philosophy of ‘positive-thinking’ differ from both ‘born-again’ Evangelical Christianity and the liberal wing of American Protestantism? JW: Peale was unapologetically both a Bible-based Christian and a political conservative. An American patriot, he supported the Republican Party and many of its candidates, being quite the Manhattan renegade for that! However, his writings and philosophy are clearly aligned with New Age beliefs. He advocated for the belief in the ability of properly directed thought to improve health and produce material improvements in daily life, rather than just the more intangible and ‘spiritual’ benefits sought by other Christian movements. For example, Evangelical Christianity is more accepting of pain and punishment as a corrective for the imperfection of Creation – the world as the Valley of the Shadow of Death, the scene of the Trials and Tribulations of Life through which the soul of the religious aspirant must pass on its way to Perfection in the Afterlife, God’s Kingdom for the Righteous. The Liberal Protestant is, in my opinion, more committed to being a liberal than a Protestant. Liberal Protestants are similar to left-wing Jews who support the anti-Israel policies of the Democrat Party, or pro-abortion Catholics who disdain the ignorance of their pope. Peale felt the Earth was to be enjoyed through right-thinking and ethical balance. Man was empowered to be God’s custodian on this planet, as noted in Genesis. Peale also made clear that our creative mental ability is so powerful it must be well-regulated in order not to produce unwilled negative results in the lives of those who fail to appreciate its import. JW: The New Thought Movement is particularly rooted in America. There have been European luminaries among its proponents, but it is an indigenous philosophy that shares the ‘can do’ spirit on which this country is based. Its most immediate roots are among the New England Transcendentalists, especially Ralph Waldo Emerson (1803–1882). Emerson was a prolific writer and lecturer, an ordained clergyman, a scholar of Indian spiritual thought, Buddhism, Zoroastrianism, and Hermeticism. Having openly reached into the Wisdom of the East for spiritual sustenance, he is credited with having influenced the American religious broadening of the nineteenth century and beyond, to include Mormonism, Psychism, and New Thought. Emerson is referenced by name in Peale’s work. On the other hand, the Transcendentalists were hardly New Thought proponents. Their high-minded idealism went far beyond the earthly concerns of New Thought. But Emerson’s brand of religious and spiritual experimentation opened a series of options to America in which many contemporary trends could manifest. The mid-nineteenth century was the time of Eliphas Lévi, Edward Bulwer-Lytton, Madame Blavatsky, P. B. Randolph, the flourishing of Freemasonry (and the concomitant scandals associated with some of its excesses), the establishment of alternative utopian communities, the rise of Spiritualism, and the publicising of psychic phenomena. Even Abraham and Mary Todd Lincoln were believed to have sought communication with their deceased son in White House séances. Emerson’s efforts helped foster the explosive burst of religious creativity of the time. Mitch Horowitz dates the first of the actual New Thought proponents to the 1830s in the person of Phineas P. Quimby in Maine. Quimby’s most noted disciple was Mary Baker Eddy, the founder of Christian Science. Her singular obsession with mental influence controlling physical events was the most extreme denial of physical reality within the New Thought movement. Wallace D. Wattles (1860–1911) was the direct precursor of the Law of Attraction teachings made popular by The Secret. I remember when Destiny Books opened its publishing doors in the mid-1970s. Among its first titles was a mass market paperback version of Wattles’ Financial Success, now retitled The Science of Getting Rich and still in print. Wattles was also a social reformer who ran for political office as a socialist before his death. He was joined in his idealism by Elbert Hubbard, Ralph Waldo Trine, and Ernest Holmes (1887–1960). Holmes started the Church of Religious Science in Los Angeles in 1932 and was the author of The Science of Mind, a vastly influential text in the canon of New Thought. Holmes was the direct link between Dr. Peale and New Thought. Peale read Holmes in the early 1920s, just before entering the School of Theology at Boston University. At the same time as the New Thought Movement was flourishing, the early twentieth century brought out a number of spiritual teachers whose work lives on today. Foremost among these is, of course, Manly Palmer Hall (1901–1990). His opening of the higher Mysteries of myth, religion, and philosophy to a wider audience continues to resonate in his bestselling books. It is likely he and Holmes crossed paths on the Los Angeles lecture circuit of the day. ND: Today positive-thinking is universally identified with Oprah, other ‘New Age’ celebrities, and supporters of Trump’s rival for the presidency, Hillary Clinton. Many of them active in a range of progressive social movements. Yet Norman Vincent Peale, the Trump family pastor, as you point out, was a traditional American conservative. He’s even been quoted as saying the choice is between “Christ or Communism” and “Christ or the police state.” Rev. Peale comes across as no friend of progressives. JW: Communism, the Police State, Sharia Law, Hillary Clinton, and Oprah all share an adherence to a common principle: Collectivism. This is the idea that the interests of the individual are, and must/should be, subservient to those of the group. This pernicious philosophy was enunciated in Europe by Jean Jacques Rousseau (1712–1778) and Georg Wilhelm Friedrich Hegel (1770–1831), the intellectual godparents of Karl Marx (1818–1883). Collectivists assume that the ills of society and the flaws of the human design can be corrected by ‘experts’ – if only they are given enough time and control. Opposed to all of them are the writings of philosophers like John Locke (1632–1704) the intellectual founder of the concept of limited government. Locke’s philosophy was ultimately embodied in Thomas Jefferson’s Declaration of Independence and the strict binding of government from mischief by the chains of law as outlined in the United States Constitution. Individualism presupposes that the greatest good will come to the greatest number by respecting the inherent Liberty of each person – the unalienable rights we mentioned earlier. Peale’s conservatism and anti-Communism would put him in the individualist camp. The powers of positive thinking and the link to the universal mind proclaimed by Peale and the New Thought movement seems to me more amenable to Individualism than Collectivism. Although I was born Jewish, I accept the concept of America as a ‘Christian nation’ because I believe the Judeo-Christian tradition is the home of Individualism. Our concept of a human relationship with God is very personal. Abraham was prepared to sacrifice his only son at God’s command. Jesus is constantly speaking to people who must make decisions, accept responsibilities, commit to tasks in their personal lives. This all bespeaks the freedom and necessity to choose. ND: New Thought, Mind Science, Positive Thinking… This is as you say quintessential American philosophy, a big part of the ‘New Age’. How has this very American worldview shaped Donald Trump? Is he America’s first ‘Positive Thinking’ President? While I appreciate differences among our people, I reject ‘diversity’ as a goal in and of itself. I think countries should welcome those who embrace the dominant national identity. For example, my grandparents fled the Russian pogroms at the beginning of the twentieth century. But once arrived here, even though none of them spoke English, they became Americans. Their kids taught them English as they learned it in school. No multi-culturalism in those days! My grandparents contributed to the economy and strength of their new homeland. And they influenced their grandchildren to love America as a beacon of light and freedom. Trump’s family had the same dynamics I would expect. But Trump went on to state what I believe is the most important belief of the New Thought movement and the reason Donald Trump will be correctly identified as America’s first New Thought President. ND: You mention the British occultist Aleister Crowley whose life and teachings you have studied and written about for more than four decades. You also have a long personal involvement with Crowley’s magickal orders – even described as a ‘founding father’ of the modern O.T.O – as documented in your 2012 book In the Center of the Fire, A Memoir of the Occult. 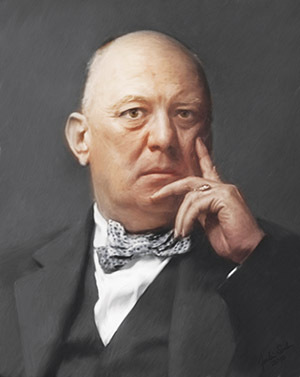 Do you believe Donald J. Trump is an example of Aleister Crowley’s teachings of Thelema (Will)? JW: You ask if I consider Trump an example of Thelema and the law of Do what thou wilt. (And you seem unconcerned that I could be tarred and feathered by the majority of modern Crowley supporters who are as progressive in their politics as the liberal Protestants we discussed earlier!) But my answer is yes. I listen to Trump and observe him in action, and he seems every bit the creative, take-no-prisoners example of a person who is living his own inner truth despite the cackling and caterwauling of his detractors. I watch his speeches and detect his love for his supporters and America. I see him with his family, and I know for all his brashness, arrogance, and bull-in-the-china-shop personality, that here is a man who understands the second part of our Thelemic equation, Love is the law. ND: Aleister Crowley proclaimed the dawn of a new age he called the ‘Aeon of Horus’, which would overturn outdated, ossified codes and beliefs. This New Aeon, while offering humanity unprecedented opportunities for self-realisation and self-actualisation, would also be marked by terrible conflicts, strife and upheavals of all kind. Where is humanity today in relation to the incoming ‘Aeon of Horus’? Do you see the election of outsider Donald Trump as a significant part of this period of transition into a new age? JW: The Aeon of Horus was announced in The Book of the Law, received by Aleister Crowley in 1904. Extending some 2,000 years, the New Aeon or Aeon of the Child supersedes the previous period of the Aeon of Osiris or Aeon of the Father. Crowley pointed out in 1938 some of the characteristics of this New Aeon, “Superficially, they appear appalling. We see some of them already with terrifying clarity. But fear not!” The disruption of virtually all norms would refresh the opportunity for the self-discovery of the human race. I hope Trump accomplishes the goals he has set forth of rebuilding the nation state. If he is able to succeed as a leader, America will retain its design as a Thelemic country whose long-lived written Constitution enshrines the principle of the sacred Liberty of the Individual as its sovereign goal. We shall certainly see. ND: In your book The Secrets of Masonic Washington you detail the Masonic influences on the birth and development of the American Republic. You show that in the New World, free of monarchy and aristocracy, the ideas of the Enlightenment were able to flourish. Do you think the values and vision of America’s Founding Fathers can be revived today under a Trump presidency? JW: I do. I find it interesting that Trump is a builder, like Solomon in the Bible and the Freemasons whose vision and principles built America. Trump is the ultimate pragmatist. I wish he had a more ideological mindset that would place philosophy above the deliberative process, but I think he has good instincts. And good influences around him to steer him away from potential overreaches. I also believe he sincerely loves this country. When I heard him say, “We do not seek to impose our way of life on anyone, but rather to let it shine as an example for everyone to follow,” I thought even Thomas Jefferson might not have said it better. Humility, love of Liberty, and the role of the Creator in the pursuit of our national destiny are values I believe are shared by the Founding Fathers, Dr. Peale, and President Trump. If America can come together under a President Trump, it seems to me that every day, in every way, we’ll get better and better as a nation and a world! James Wasserman’s revealing article ‘Crowley & Trump: A Magickal Connection?’ accompanies the above interview. It is available by purchasing this issue. This article was published in New Dawn 161.